Leading Rotherham manufacturer Beatson Clark has captured the flavour of the American south in the new bespoke bottle it has designed for Jim Beam Original Bourbon Sauce. The embossed bottle has been designed to echo the shape of the replica 1940s stillhouse at the Jim Beam distillery in Kentucky. The sauce is being launched this year by Manchester-based The Flava People. Danielle Complin from The Flava People, said: "With its angled shoulders the glass bottle has been modelled on the Jim Beam Still House and it also echoes the classic shape of the hip flask. "It really stands out from the array of round or rectangular bottles that you currently see on the shelf." 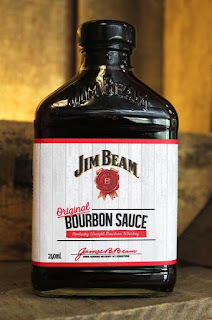 Charlotte Taylor, marketing manager at Beatson Clark, added: "Our customer was looking for a unique, signature bottle which would stand out on the shelf and have a weighty, premium look and feel while at the same time communicating the well known Jim Beam brand. "Our in-house design team worked closely with The Flava People and we're pleased to say they're really happy with the end result, which stands out partly because it looks more like a spirit bottle than a sauce bottle. "Embossing is a really popular option at the moment, allowing brands to really make a statement with a unique bottle design, and our new design software means that we can sculpt the embossing, making it more defined as well as easier to manufacture." The historic company has recently put in place a long term, £12m investment programme which included building a new amber furnace, a new six-section bottle forming machine and a new capping machine. A £5.4m white flint furnace became fully operational in 2012. As well as improving the production process, Beatson Clark also invested in new design technology. The company updated its CAD (Computer-Aided Design) system to the latest 3D visualisation software. A new key account manager has recently been appointed to support the company's steady growth. Aaron Broadley has joined from Encase Packaging in Banbury and will cover the south of England for Beatson Clark, working closely with the business development manager Alison Hughes and handling the company's existing client accounts such as English Provender, Meantime Brewery and Aspall.